No comparison to Malwarebytes. Interface looks old. Scan was much slower than MWB. Actually I install everything I review on here & always have - One thing people should be aware of is unlike Mbam there is no free trail & no free version either, on install you are immediately greeted with a large garish banner asking for $34.00 with a special offer for 2 PC's at the same cost. After scanning the program found 'WinPatrol' as malicious & it certainly isn't, the program however does come with an uninstaller though, (did you install it Pkshadow?) but adds 2 run entries on startup - Prefer Mbam & as I fix PC's for a living I've seen just about all the malware there is around - Free ADW Cleaner along with free Mbam & TDS cleaner will find just about all there is. This program is not highly rated on here though the author gave it 5 stars - To be fair I will not review it again. I agree with the author that you have to use the program to write a review and also even if have MBAM and a good AV program things slip through that should not and you will need any and all resources to kick it out and that might not be enough to get back to normal. With no uninstaller 4 stars. I am an author of UnHackMe. We never pay for reviews. 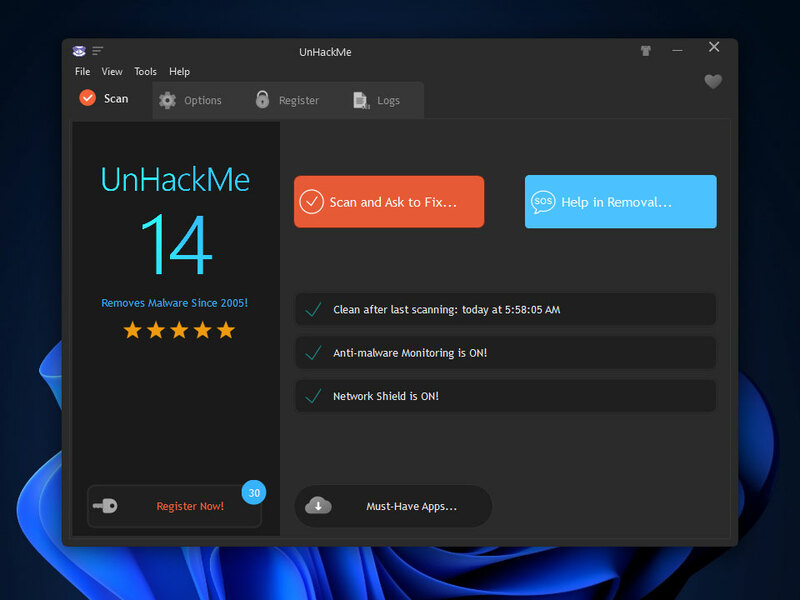 UnHackMe is older and better than MBAM in any cases. BANDIT & Music4Ever = MBAM affiliates. Please, do not spam here. I clean everyday the computers with installed MBAM and antivirus. In any cases you CANNOT make a review without testing a program. They are real. I promise. UnHackMe from Greatis Software is a great free program that helped me easily remove malware from my computer. I love this program and their support team is friendly and efficient when you need help. I hope this software will continue to improve. I like the concept but in my system I found myself in an endless loop of reboots trying to delete a file that UnHackMe said was not on my machine.. I found much of the documentation hard to follow. The translation is in need of fine tuning. Any way Good luck to the development team. I hope you can refine this program so that it is more anglo-friendly and fool-usable. This program caused so many problems for my machine its unreal! First of all, when I tried to uninstall it via add/remove, it wouldn't do it! Secondly, when I tried to search for it manually, it wouldn't show up anywhere! I found out that it was a hidden folder!? Why would this be a hidden app let alone the entire folder? I am running Vista 64bit and it was fine until I got this program, it took me 8 hours of multiple rollbacks to get my system back to semi-normal state. Don't use this junk. You'll regret it. "make my keybowd stopp werkk!!!!" That's because you told it to do that, dumbs***!!! It's either because your keyboard is an alien spacecraft with useless software integration, or your keyboard is wireless and you told UnHackMe to disable the usb wi-ware. Will this do anything that NAV or McAfee won't?